Gamma (γ)-hydroxybutyric acid (GHB) has been reported to be an endogenous compound in the mammalian brain. It used to treat symptoms of alcohol, opioid, and drug withdrawal and cataplexy of narcolepsy. However, it is often used for criminal purposes because it is colorless, tasteless, and has short half-life. For this reason, there is a need for a method of distinguishing between endogenous and exogenous GHB administration. Therefore, urine from rat before administration of GHB and GHB urine after the single intraperitoneal injection of GHB as 60 mg/100 g were collected from Sprague-Dawley rats (7 weeks old, 10 males and females). Negative control urine, urine from individuals suspected of taking GHB, and urine from victims who were GHB-involved crime were collected. In urine samples, GHB was extracted with two-step SPE and collected fraction was derivatized and analyzed by GC/MS and GC/C/IRMS. In GC/MS and GC/C/IRMS analysis of rat urine, there was a statistically significant difference between urine from rat before administration of GHB and GHB rat urine (p < 0.05). In GC/MS analysis of human urine samples, there was no significant difference among human urine groups (negative control, suspects’ urine, and victims’ urine), but in GC/C/IRMS analysis of human urine samples, there was a statistically significant difference among human urine groups (p = 0.0001). Through these results, GC/C/IRMS can be more effective tool to identify endogenous and exogenous GHB in urine than GC/MS. 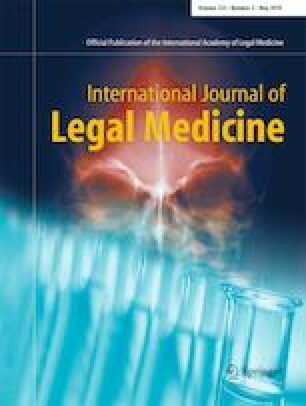 This study can build a drug management system in forensic investigation agency and offer interpretation method to forensic science and court. Hyojeong Kim and Donghun Lee equally contributed to this study as first authors. Hyojeong Kim and Donghun Lee equally contributed to this study as first authors. And the authors would like to thank Seojeong Jang and Namji Kwon in Duksung Women’s University for competently performing the laboratory experiments and technical help and comments. This study was funded by National Forensic Service (NFS) (grant number is 2017-04, the development of analysis method for identification of endogenous and exogenous GHB) and Priority Research Centers Program through the National Research Foundation of Korea (NRF) funded by the Ministry of Education, Science and Technology, Republic of Korea (grant number is 2016R1A6A1A03007648).